While both Air France and KLM have ordered the A350, only Air France will operate the aircraft. According to The Travellers Club, Air France will receive all of KLM’s A350 orders, while the airline’s remaining 787 orders will be sent to KLM. Air France and KLM are both held by the same holding company, Air France-KLM. The group has recently been involved in an international dispute, as the Dutch Government recently bought shares in the group to assume more control of the group. At the moment, the group has a total outstanding order of 28 Airbus A350s. All of the aircraft are the -900 variant of the family. This is currently split with 21 of the aircraft destined for Air France, and seven for KLM. However, this is due to change, as Air France is now expecting all 28 of the aircraft. On Boeing’s order books, a total of 25 Boeing 787 aircraft have been ordered. This consists of 17 Boeing 787-9 aircraft, and eight Boeing 787-10 aircraft. So far 13 -9s are in operation by KLM, while seven are in operation by Air France. Boeing has only confirmed eight 787-9 deliveries from the groups order at present. This means that some of the aircraft are currently leased. Au Revoir to the Air France 787? While Air France will exclusively operate the Airbus A350, it looks as though KLM will not exclusively operate the Boeing 787. Instead, Air France is looking to continue operating the Boeing 787 aircraft which it has already received, however, remaining orders from the American manufacturer will be sent to KLM. This includes the Boeing 787-10, which will be exclusively operated by the Dutch KLM. KLM is set to receive its first Boeing 787-10 later this year, with flights due to commence on the 1st July. KLM will be the first European operator of -10 variety. The aircraft will initially operate a triangle route from Amsterdam to Kilimanjaro, to Dar es Salaam, to Amsterdam. The flight will operate four times a week. On the remaining three days, the aircraft will operate a return flight to Dubai from the 3rd of July. A second aircraft will begin five weekly services to Toronto from the 29th of September. Additionally, from 1st of October, the Dubai flight will become five weekly. Will you miss seeing A350s in KLM Blue? Let us know in the comments down below! Not surprising. KLM have always been heavily pro-Boeing (apart from a few A330s), and AF have traditionally been heavily pro-Airbus (apart from a large fleet of 777s). How about you hear it straight from the horse’s mouth? 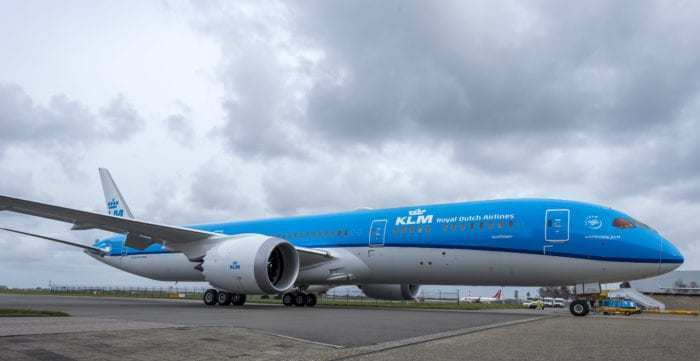 “At the A4E Aviation Summit in Brussels, the CEO of KLM Royal Dutch Airlines has, once again, denied all rumours about the airline not taking delivery of the Airbus A350. I would buy what KLM’s CEO is saying over some workers union report.